San Pedro lies close to the border with Bolivia, so with our time running out, it made sense for us to cross over here. However, being such touristy areas on both sides of the border, there is no public transport available. The only way is through one of the many companies that run 4×4 trips across to the Uyuni Salt Flat. So, once again we would be herded along the tourist trail. The trip of three days was all inclusive and would cost us only a little more than our planned daily budget for those days. In addition, after reading the tourist reviews describing raving drunken drivers, accidents and sub zero temperatures without heating, it seemed the trip might be a bit of an adventure after all. So early on friday morning we congregated outside the office with the other tourists and we were bussed acrtoss the Atacama plains and up up up onto the high plains of Bolivia. As usual, with only 3 free pages in my passport, the border crossing was a bit of an ordeal, as I beg in stuttered Spanish to the officals not to stamp on an empty page . And then we were in Bolivia. We met with our very nice driver and the three people who would be our travelling partners for the next 3 days then we were off across the plains. Laguna Verde, a still lagoon that reflected the mountains behind, but as the wind picked up, transformed into an opaque surface of unbelieveable emerald green. Laguna Colorada, a white salt plain laced with waterways of a deep red colour in which hundreds of flamingoes congregate. Boiling hot mud! An area of numerous pools of sticky, smooth, bubbling mud, all in slightly different shades of grey, ochre and terracotta. At the end of the first day we slept at a very rustic accommodation on the edge of yet another beatiful white salt lagoon. We went for a walk to see the sun down, which was nice, but unlike the day which was very sunny and mild, it was seriously cold on the walk back with sub zero temperature and a brisk wind. The next morning I was up for more cold though and got up to take photos of sunrise. I was warm enough in all my clothes, but the pain in the finger tips from trying to operate a camera in that kind of weather was severe. The second day brought even more stunning sights with forests of sculpted standing rocks in the desert, more shades of yellow and red and white on the hills. We also stopped in a couple of tiny desert towns, and passed through some amazing rustic farmsteads with piled stone walls and houses and fields of quinoa, and of course lots of llamas. The Bolivian people too are so different to what we’ve seen so far. The older women all wear the most improbable traditional costume that consists of petticoats, stockings, heeled sandals and bowler hats, and the children all seem to come out of the postcards you see of cute South American kids. The end of the second day brought us to the edge of the salt flats for the night. Unfortunately we weren’t in a good position for sun down, but we convinced our driver to get us up early for the sunrise. So at 5.30am we were in the Landcruiser and by sunrise we were standing on a dead flat, snow white plain of salt stretching over 100km across and apparently up to 4m deep. Needless to say, it was a nice sunrise. We spent a hour or so doing the mandatory distorted perspective photos on the white salt. Evidently we didn’t spend as long as a lot of people, as we saw some really great shots in Uyuni town. Next we were off to the Isla de Pescadores, a little island in the salt lake, covered with the most enormous cacti as well as some amazing coral/rock formations. The rocks and cacti, with the white plains in the background and clear blue sky made for some very picturesque scenes. 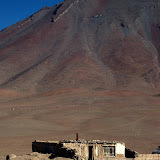 The last stop on the salt flat was the old salt hotel. Thats right, its actually made of blocks of salt, cut from the salt flat. There was a time when you could actually stay there, but apparently they didn’t adequately account for how much the salt would preserve the sewage generated by the hotel and it eventually became too smelly. Our final stop before we were left in Uyuni town was the train graveyard. A yard filled with rusty old trains, abandoned here in the 50s. Very interesting to see these old machines, in various states of decay. Apparently the grafitti artists of Uyuni are on the higher end of the intellectual scale as many of the trains were profaned with equations from Newton and Einstein. And that brought our trip to an end. Lots of wonderful sights were seen, and it was actually quite nice to be herded from one beautiful place to another for a change and not have to worry about our next bed or meal. Our crew was also very nice, and we made some good friends over the three days together. And so we left our cosy Landcruiser to face the real world in a new and very different country, Bolivia. A three day journey into Bolivia via the stunning high altitude plains of Bolivia. Barren plains, coloured lagoons, salt flats and flamingoes abound. Really beautiful pics! seems to be one of the nicest places you went, isn´t it? hope to see you soon! always reading about you! Adventures of Dean and Sophie is powered by	WordPress 2.8.5 and delivered to you in 0.215 seconds using 33 queries.